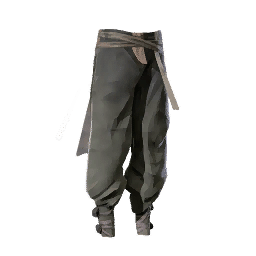 Shabu Guard Pants is a type of Armor in Absolver. Large and supple trousers, worn by the Shabu Guard of the Orate empress. Low cuts don't restrict movement. Bands of fabric indicate rank and accomplishments. A cairn across a walkway near the mentor NPC contains a clean green version. Has anyone found these not ragged, AND black?